Christ Arose (for congregation and orchestra) is a two-part arrangement of the beloved Easter hymn, Christ Arose. Part 1 is arranged to serve as the closer for a Good Friday service. It leaves participants “hanging” as they reflect on their Savior buried in a tomb. Part 2 is the refrain, and is designed to open an Easter Sunday morning service. It encourages the participants to eagerly rejoice in their risen Savior. This version is for congregation and full orchestra. (If you are interested in a version for just piano, please contact me directly.) All scores and parts are included, and with your purchase may be duplicated for your ministry as needed. Also, permission is granted to copy vocal parts for as many members of your choir or congregation that you have. 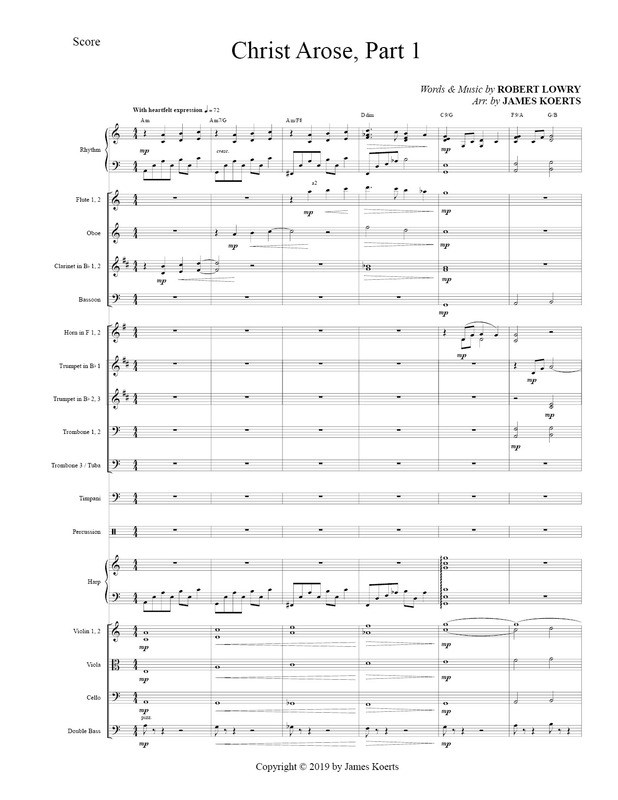 Orchestration includes: score, rhythm (piano & chords), vocals, flute 1 & 2, oboe, clarinet in Bb 1 & 2, bassoon, horn in F 1 & 2, trumpet 1-3, trombone 1-3, tuba, timpani, percussion, harp, violin 1 & 2, viola, cello, and double bass. Substitute parts include bass clarinet (for bassoon), alto sax (for horn in F), and tenor sax (for trombone 1 & 2).